Directorate Jail Rajasthan Notification 2018 – Apply Online For 670 Jail Prahari Posts : Prison Department of Rajasthan has issued Rajasthan Jail Prahari Recruitment 2018 Notification for filling up 670 vacancies. The applicants is inviting for recruitment of candidates TSP Area. This is a golden opportunity for job seekers who are searching job in Rajasthan State. 670 Jail Prahari were announced on 20.07.2018 through Raj Jail Prahai Vacancy Notification. Candidates who qualified 10th Examination can apply online for Rajasthan Prison Jobs 2018 from 26th July 2018. The last date of submission Jailprahariraj2018.in online form is 16th August 2018. To Know More about like Rajasthan Jail Prahari Bharti like eligibility criteria, selection procedure & other readout full article carefully. Fresh Update as on 27th July 2018 : Dear Applicant, Rajasthan Jail Warder Recruitment online Form is now available. You can apply online to click on below link. The last date of registration for Raj Jail Prahari Jobs is 16th August 2018. Candidates must qualified 10th Standard Examination from recognized board for Rajasthan Prahari Recruitment 2018. Rest details check Raj Prahari Job Notification. Age Relaxation is applicable for Directorate Jail Prahari Rajasthan Recruitment 2018 is as per the rules of the Government. For more relaxation of Rajasthan Jail Prahari Recruitment 2018 check official notification. Candidates Selection For Raj Jail Prahari Recruitment 2018 according to exam scheme and other parameters set by department. Check below section. For more information visit jailprahariraj2018.in. Submit your Rajasthan Jail Prahari Vacancy Application Fees through e-mitra center. Refer information check Rajasthan Jail Department Recruitment Notification. First of all candidates go to official site jailprahariraj2018.in. 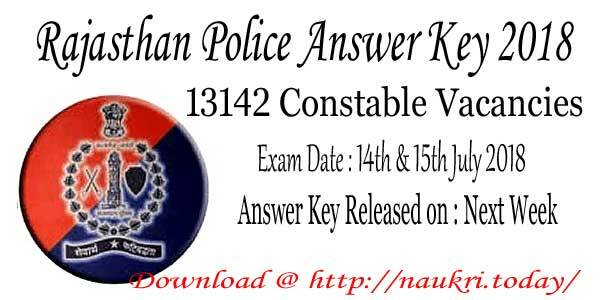 Click on the link download Raj Jail Prahari Vacancy 2018 through below link. Online Application Form of Rajasthan Jail Prahari Jobs 2018 also mention below. Enter all require information of in your application form. Make payment of application fees of Jail Prahari Rajasthan Recruitment. Submit application form with all correct information. Take Print out of Raj Jail Prahari Bharti 2018 Online Form for future uses. You can apply on directly through below link. Rajasthan Jail Prahari Recruitment 2018 for 670 Jail Warder Vacancy. Apply Online and other Download notification link available above section. Candidates can start apply online for Jail Prahari Rajasthan Jobs through online mode from 26th July 2018 at 6.00 PM. Interested and eligible candidates can fill online application form before the last date 16th August 2018. Participants will select according to written exam & PET. There are application fees & Pay scale also for Rajasthan Jail Department Recruitment 2018. Furthermore, information read our full article carefully. 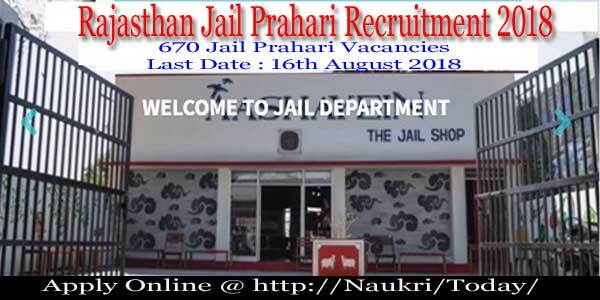 Conclusion: Directorate Jail Rajasthan, Jaipur is inviting application form for 670 Jail Prahari Vacancy. Last date of Apply Online for Rajasthan Jail Prahari Recruitment 2018 is 16.08.2018. The examination will organize in the month of September/October 2018.